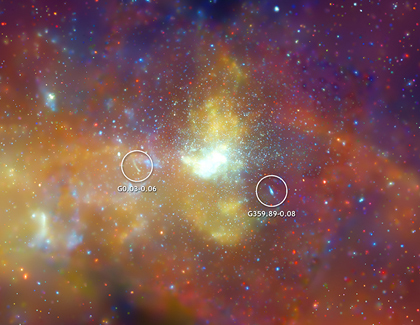 A deep new image of the center of the Milky Way by the Chandra X-ray Observatory has been obtained. The diffuse X-ray light is from gas that has been heated by stellar explosions, outflows powered by the central supermassive black hole and winds from massive stars. The thousands of point sources are produced by normal stars feeding material onto compact, stellar remnants: black holes, neutron stars and white dwarfs. A dramatic new vista of the center of the Milky Way galaxy from NASA's Chandra X-ray Observatory exposes new levels of the complexity and intrigue in the Galactic center. The mosaic of 88 Chandra pointings represents a freeze-frame of the spectacle of stellar evolution, from bright young stars to black holes, in a crowded, hostile environment dominated by a central, supermassive black hole. Permeating the region is a diffuse haze of X-ray light from gas that has been heated to millions of degrees by winds from massive young stars - which appear to form more frequently here than elsewhere in the Galaxy - explosions of dying stars, and outflows powered by the supermassive black hole - known as Sagittarius A* (Sgr A*). Data from Chandra and other X-ray telescopes suggest that giant X-ray flares from this black hole occurred about 50 and about 300 years earlier. The area around Sgr A* also contains several mysterious X-ray filaments. Some of these likely represent huge magnetic structures interacting with streams of very energetic electrons produced by rapidly spinning neutron stars or perhaps by a gigantic analog of a solar flare. Scattered throughout the region are thousands of point-like X-ray sources. These are produced by normal stars feeding material onto the compact, dense remains of stars that have reached the end of their evolutionary trail - white dwarfs, neutron stars and black holes. Because X-rays penetrate the gas and dust that blocks optical light coming from the center of the galaxy, Chandra is a powerful tool for studying the Galactic Center. This image combines low energy X-rays (colored red), intermediate energy X-rays (green) and high energy X-rays (blue). The image is being released at the beginning of the "Chandra's First Decade of Discovery" symposium being held in Boston, Mass. This four-day conference will celebrate the great science Chandra has uncovered in its first ten years of operations. To help commemorate this event, several of the astronauts who were onboard the Space Shuttle Columbia - including Commander Eileen Collins - that launched Chandra on July 23, 1999, will be in attendance. Credit NASA/CXC/UMass/D. Wang et al. Thanks a lot. I am really interested in the Milky Way and black holes so this article is amazing, but how many black holes surround the center of the galaxy? The GC has evidently exploded on an exponential schedule, for the last 13,000 years. I can document 60 events one way or another and can relate to the appearance of the Cygnus Loop in the sky. Could this have happened and could the schedule of explosions from the Galactic Center have been on such a regular schedule. That is could there be a body near Sag A that occults it on occasion. Presently the events I found seem to come close to matching the Solar Max 11 year cycle as they fall at about an interval of 22 years. One of the most amazing sites. Beautiful. One thing that I wanted to ask you was, what are the dimensions of our galaxy? I asked this because I read a science report from AOL news I do not remember if it was from one of the telescope sites or in the science section of one of the US newspapers. But it said that there had been a careful study measurements made of our galaxy and it was claimed that our galaxy was larger than before believed. It claimed that our galaxy and the Andromida galaxy were both about the same size. The diameter I ran across was in a very recent astronomy text book and it gave the diameter of our galaxy to be 130,000 light years. The Andromida diameter was given as 160,000 light years. Could you please straiten this out for me? I keep running across many different sizes for our galaxy. Would like to know whether our SUN revolves around the Star Alcyone, which intern revolves around the star Sirius. Is there a picture of the Orbit of Sirius? mass of about ten times the Sun. Another big difference is that the latter are believed to come from the supernova explosion of a massive star, while the origin of supermassive black holes is much more of a mystery. However, many of the properties of these 2 classes of black hole are similar and scale with mass. Thanks for your question. Astronomers believe the 1E sources are binary systems -or pairs of orbiting objects- that contain a black hole or a neutron star. Sagittarius A*? They appear very bright at the center of their formations, which seems to indicate a very large central mass. Please let us know. Thanks very much. Could you please give an explanation of the difference between the black whole in the center of our galaxy and the type some stars turn into? A very beautiful view of our galactic center. Sgr B2: An example of a giant molecular cloud - objects where astronomers believe most stars form. Molecular clouds are very cold and can't emit high energy X-rays themselves. So, the Sgr B2 cloud may be reflecting X-rays from a nearby hot, bright source. The only object bright enough to illuminate Sgr B2 is the massive black hole in the center of our Galaxy, Sgr A*. Sgr B1: First discovered in 1959 in infrared light (much longer than Chandra's X-ray wavelengths), this molecular cloud is one of many star-forming regions in the center of our Galaxy. Sgr B1 is surrounded by a halo of gas that is 5,000 times more massive than the Sun. It's very beautiful, but in the labeled photo are some other points labeled as Sagittarius B. Are they other black holes? It's very interesting, but I would like to know what kind of objects are Sag b and the other I saw in the labeled image? Are they other black holes? Beautiful. In case people don't know, Sagittarius A* is the very middle of the Galactic Center, which is a happening place with thousands of stars close together. So amazingly beautiful. I love x-ray images.